In most lines of work, in most aspects of life, being mercurial is not traditionally seen as a positive trait. “The key to life”, I was once told at a job interview, by a man who thought that selling insurance to people on their death bed was a morally right thing to do, “is consistency.” I never got that job, and I cannot remember any other part of that interview apart from that snippet. It has stuck to me for years like a safety pin on your old favourite jacket – a reminder to myself to never embrace the obvious, or the plain, and to always applaud the unpredictable. As a sports fan, this mindset has enabled me to see beyond pure success, and to grow to love, respect, and even idolise the mavericks, the outsiders who take sport by the scruff of the neck, and make you believe in the beauty of sport. They make you feel the life affirming joys, and the tragic lowest of lows. Whilst Bill Shankly’s infamous quote that “football’s not a matter of life and death … it’s more important than that,” might be one of the most overblown and ludicrous statements ever made, it is absolutely true that sport is a religion to literally millions of people around the globe, and so the whole idea of sport in general should never be seen in a less important, or less relevant light than anything else. The beauty of a last minute equaliser, or a wicket in the last over, or a twelfth round knockout evoke feelings more profound in the human psyche than any piece of writing, any romantic situation, or any religious enlightenment. These emotions, these feelings would not occur without the actual competitors taking part. The majority of sports men and women are built the same way – determined athletes, who have harnessed their talents from a young age, and have subsequently dedicated the majority of their lives to pursue one single goal – to become a success in their chosen sport. Although this might sound familiar to anybody who has ever attempted to achieve their goals, most professions, most lines of work do not require you to give up almost everything – social lives, emotional development, and as depressing as it is to write, personalities. The sad fact is, most people in sport are boring, and that is why when someone comes along with the gift of the gab, a bit of an attitude, something to say, they are usually quickly made notorious, and sports fans usually either love them, or they hate them. The idea of the ‘Halo Effect’ in Psychology refers to the theory that “the perception of a particular trait is influenced by the perception of the former traits in a sequence of interpretations.” Simply put, this means that there is usually a central theme in something that affects the way we feel about that particular thing. An iPod for example, is seen as a desirable, must have product despite the actual technology inside it being no different to other music players on the market for lower prices. This corresponds with a study by Solomon Asch which suggested that attractiveness is a central trait for the way in which we view anything (although he referred to people in his study), so thus we presume all the other traits of an attractive item (or person) are just as attractive and sought after. Hence, the iPod, with its futuristic, clean arty look is so wanted by people, because they assume that everything must be incredible about it. This relates to sports, and those individuals that the public, the media, and other sportsmen are so fascinated by. People view these individuals as initially attractive, confident or different, or in the other extreme, as brash, undeserving and arrogant. Hence these initial perceptions we make shape the way we look at them forever. So, in a world of the same, the different are usually always remembered. Take George Best as an example of this. There was a man who is perhaps the ultimate example of underachievement, which when you consider that he won the League Title twice, the European Cup, and was the European player of the year in 1968 is some statement to make. 138 league goals in 361 games is some record for a player who was never a traditional striker, and had that alone been his only contribution to football he would have been seen as a legend, but it was his sad decline that really stands out – especially for the likes of me who never saw him at his best. After leaving Manchester United in 1974 aged 27 – an age where footballers usually peak, he spent the next ten years of his life meandering throughout the world, playing for whoever would have him, and pay him beer money. He ended his career travelling from city to city in the hope of a career revival. From Stockport to Cork, Hibernian to Brisbane, Best plied his trade as best he could, but his glory days were long gone. Despite his decline, and despite the alcohol abuse that eventually ended his life prematurely, he is still seen as an icon, regularly appearing in ‘Best Players of All Time’ lists. He even appeals to those who usually prefer the more disciplined. The sports writer Simon Barnes remarked in a tribute piece on Best that he “had a talent for football that bordered on love.” Barnes added that “There was nobody like him with a football. Ever.” Strong words for a man that only a select few of us can fully recall in his pomp, and in his full glory. I remember once, the night that George Best died in 2005, my mum and my brother having an argument about him. My mother was adamant that Best had “fucked his whole life up” which was a big statement to make, especially considering that she never swears. My brother simply replied that he didn’t understand why there was so much animosity towards Best – especially as his life dragged on with liver transplants and much younger wives. “He spent his life how he wanted,” said my brother, “he did what he wanted with his life, and how many people can say that?” I was surprised by that, as my dear brother, as clever as he is usually attempts to just insult everybody. Still though, I can’t help but feel that these sort of people would be destroyed in any other job. Think of yourself working in an office selling staplers. Everybody just gets stuck in, and does their best to sell their staplers, but there is one employee who rarely turns up on time, is usually dressed inappropriately, and is generally a nuisance, but once or twice a week they suddenly sell forty staplers and make every other worker look terrible in comparison. Would that ever happen? Or would they never get the job in the first place? That’s not to say that it’s a bad thing that they wouldn’t, but it’s one of those things which makes sport seem so distant from the rest of the world. “How Tracy Austin Broke My Heart,” an article by David Foster Wallace in his book ‘Consider the Lobster’ examines how the great sportsman manage to make the difference. He asks: “How can great athletes shut off the Iago-like voice of the self? How can they bypass the head and simply and superbly act? How, at the critical moment, can they invoke for themselves a cliché as trite as ‘One ball at a time’ or ‘Gotta concentrate here,’ and mean it and then do it?” Perhaps the true icons of sports – the ones who seem to turn up when it matters, the Tiger Woods’, the Michael Jordan’s, the Michael Schumacher’s, took many benefits from all that emotional detachment from life that was a result of the sheer effort it took them to fully succeed in their respective sport. Maybe that is why the outsiders of sport, the ones that people love to love, maybe that’s why they don’t succeed. There is a theme. 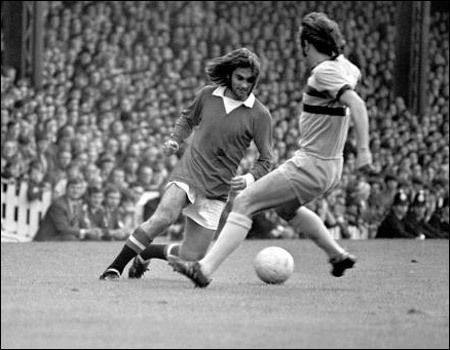 George Best – effectively retired aged 27. Paul Gascoigne – effectively retired aged 28. Stan Bowles, Jimmy Greaves, John Daly, Alex Higgins, Kirkland Laing – the talent was always there, but why did they not succeed more? Maybe it just doesn’t matter. Maybe it is just the simple fact that we, the normal humans who can’t achieve these feats of brilliance, love these people who almost achieve it, but don’t quite make it because of their personality flaws. Maybe, deep down we love these people because they remind of our shortcomings, but they also show that you can get over them and succeed at least in some ways. It is quite possible that it is these sportsman that are the ones that truly inspire us, as opposed to the robot like winners who we can’t relate to – because they too remind of our shortcomings, but the ones we try so hard to ignore. They remind us that no matter how hard we try, we’ll never be able to reach the heights that the superhero athletes do. I recalled an interview I read with the psychologist Phillip Zombardo where he talked about the idea of ‘heroism.’ It reminded me that there is a chance that it doesn’t really matter WHY we adore these people, but what is important that we do, and continue to. Zombardo spoke about the idea that study on heroism is still quite limited, mainly due to acts of heroism being difficult to spot at the instant the heroic decision is actually made. This means most interviews or analysis of heroic deeds are done well after the matter in question. With this in mind, I see no reason to stop supporting those sportsmen who have something to say, because the winners will always get their pat on their back from the medal givers and their name in the history books. What the likes of George Best get though, is a pat on the back from every single person who has ever felt the shiver in the back of their necks when their team has scored that last minute equaliser, everyone who has ever fallen in love with the idea of sport, everyone who wants the world, but is too afraid to go and get it. My name is Martin Hines, and I’m about to start a two year course in Sports Journalism at the London College Of Communication, in London. This blog is intended to charter my journey through the seedy underbelly of both the course, and of London life in general – both of which have their ups and downs. Hopefully two years from today I’ll have a plethora of posts, loads of whimsical quips, and a thousand strong following, although a lot more likely, this will be the only post I make. A little about me. My favourite sports are football, cricket, boxing and tennis, although I have an embarrassingly large interest in professional wrestling which gets scorn poured upon me on a regular basis. I used to hate golf, but Padraig Harringtons beautiful victory last year in the Open Championship opened up a new world for me. Saying that, the day I set my feet onto a golf course will be the last day I’m alive. Not a massive fan of Pringle sweaters, or being a dickhead. Well, there you go – blunt introductions complete. A whole range of sport is on this month, from football, to the continued start of the Rugby Union season, so I’ll be posting whenever I feel like I have something to say.